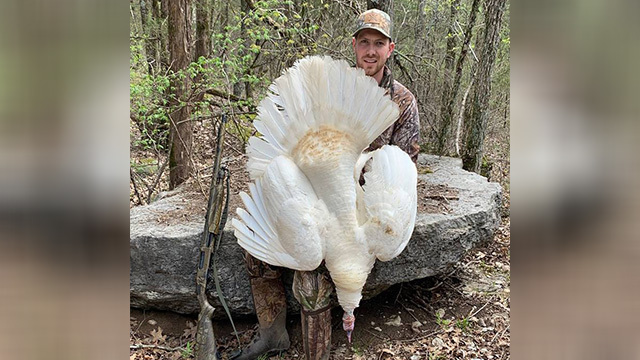 RUTHERFORD COUNTY, Tenn. (WKRN) - It was the "turkey of a lifetime" for hunter Cameron Bond, according to the Tennessee Wildlife Resource Agency (TWRA). The TWRA shared a picture of Bond, of Warren County, with the leucistic gobbler he hunted in Rutherford County. Leucism in birds is described as loss of pigmentation, according to the TWRA. The bird was 20 pounds with its beard measuring 9 1/2" and spurs at .75". The beard of the bird was dark and the back feathers had some color but a majority of the bird was white. According to TWRA's website, "Leucism is fairly common in birds, whereas albinism is much less common. You may find albinism or leucism in any species of bird, but it is more often seen (or detected) in Northern Cardinals, Red-tailed Hawks, and waterfowl because they are readily observed. In addition, corvids, i.e. crows, jays, and blackbirds, are often leucistic." For more information about turkey hunting season and regulations in Tennessee, visit tnwildlife.org.